Women were only allowed to graduate from the University following measures put in place following the Universities (Scotland) Act, 1889. 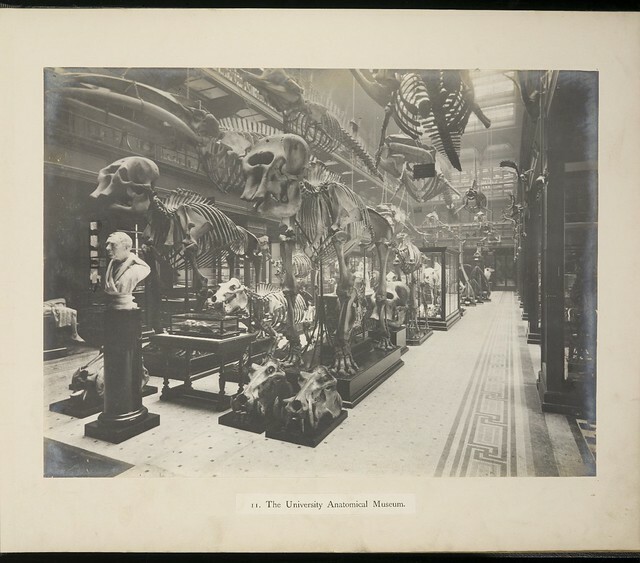 The first female undergraduates at Edinburgh were admitted in 1892 and eight graduated in 1893, all of them having previously studied at classes given by the Edinburgh Association for the University Education for Women. By 1914 a thousand women had degrees from Edinburgh University. This entry was posted in Uncategorized and tagged students, women on 28/10/2010 by Archivists. The idea for new and improved medical buildings had been mooted since 1869 and letters in this bundle refer to the N[orth] College Street Improvement Committee. There are also letters from David Baxter from Kilmaron in Fife, who was to bequeath £20,000 to the University Building Scheme on his death. It was this bequest that allowed the “General Building Committee and Acting Sub Committee” to start looking in earnest in Jan 1874 and a Public Meeting to raise funds was held in April 1874 in Edinburgh, with another in London in December of the same year. This public appeal raised £82,000 and an application was made to the Government for the rest of the money . It was estimated that the cost of erecting the new buildings and purchasing the site would be £187,000. The Government voted the University £80,000 payable in four instalments, and further appeals increased the amount raised. The money was administered by Trustees after the parliamentary money was granted in 1874. Each time a new issue arose regarding the building work, a sub-committee was established, although they all reported back to the main building committee and so references to their activities are in the main run of minute books. Between 1870 and 1874 three sites were considered for the new medical buildings. These were Chambers Street, the New Royal Infirmary grounds and Park Place and Teviot Row near Reid’s Music Room . A problem arose over a “servitude”in Park Place Lane and it was this site which was considered the most appropriate by 1874. Land had to be swapped with the City of Edinburgh Road Trustees in 1875 and also in 1875 a subcommittee was formed with the intention of removing any remaining servitudes over any part of the site. An architectural competition was held to determine who should design the new buildings and a number of leading architects were invited to submit entries. 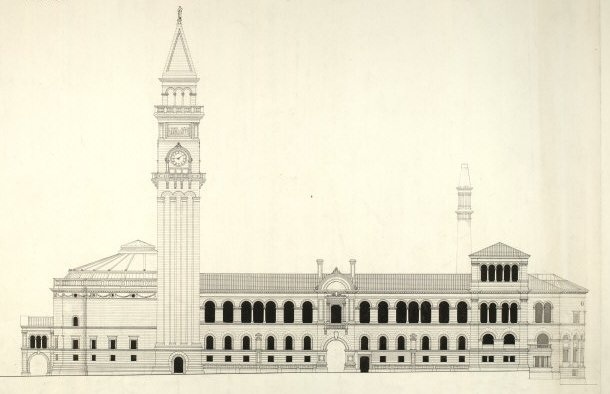 After consultation to determine the requirements of the faculty of medicine for the new building, and discussion of the comparative merits of the plans , the minute for 29 Jan 1874 stated “Mr Rowand Anderson to be employed as Architect for the new building of the University.” The design as shown in the image above was modified however, the San Marco-type campanille never been having built. Once the new medical buildings were nearing completion, there was still no Academic Hall in existence as the University had run out of money. In 1886 one of the University Buildings Extension Committee put forward the money for the purpose of obtaining an Act of Parliament so that the University could acquire the site for a new academic hall at Park Street. The compulsory powers required were obtained, but they had a limited time frame and the University needed to find money to fund the hall. William McEwan of the Edinburgh Brewing family, offered to fund the building work if the University would find money for the site in 1886. The sum needed was £12,000 but the University was unable to find this amount. A University deputation went to London to ask the Government to include this sum in the Parliamentary estimates for the year. The Treasury finally offered £8,000 in two instalments in Mar 1887, and William McEwan provided the other £4,000. In June 1888 it was revealed that the new building was to be called the McEwan Hall. The formal transfer of the New Buildings to the Senatus Academicus was passed by Resolution of the New Building Committee on 26 Oct 1888 . The work of the Building Committee was now considered to be complete, with the McEwan Hall underway, although this was not completed and handed over to the University until 1897 .Between 1903 and 1909 there was a new fundraising appeal which called itself the University Improvement and Expansion Appeal Committee. This entry was posted in Uncategorized on 21/10/2010 by Archivists. James Drever, born in Orkney in 1873, became a student at the University of Edinburgh in 1889, graduating MA before continuing to study medicine. After spending some time as assistant to the Professor of Education, he was appointed Combe Lecturer and placed in charge of the Psychology Department in 1918. In 1931 he became the first Professor of Psychology at the University, the first post of its kind in Scotland. In 1944 he was succeeded by his son, James Drever (1910-1991). James (jnr.) went on to become Principal and Vice Chancellor of the University of Dundee.This photograph is taken from an album of such photographs that was commissioned by the University and completed in 1936. It features senior academic and other figures along with associated individuals. The complete set of photographs can currently be viewed on our Flickr Photostream. This entry was posted in Uncategorized on 14/10/2010 by Archivists. William Turnbull was born at Ancrum, Roxburghshire, 29 July 1834. On 22 October 1880, he and Thomas Wilkie had been working on the construction of the Medical School for about 2 years. That date found them working on the boiler house chimney and they sealed into the structure, a bottle containing their details, along with some cuttings from The Scotsman. The bottle and its contents were discovered when the chimney was demolished in 1965. This small collection includes a note written by William Turnbull contating details about him, his wife, Cecilia, and Thomas Wilkie, which describes their idea. People such as Turnbull and Wilkie leave little trace of course in the official record. This gives just a small insight into who they were. This entry was posted in Uncategorized on 13/10/2010 by Archivists. 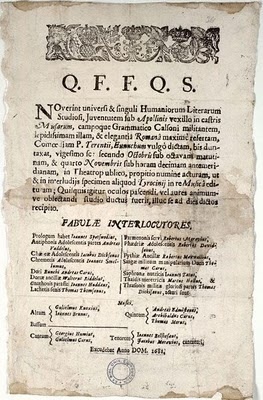 This printed notice/advertisement, written in Latin, concerns the performance of an amateur production of a play which interestingly seems to involve a joint operation with some pupils of Kelso High School. It may well be one of the earliest surviving amateur playbills. Interest in the dramatic arts evidently continued at Edinburgh, and by the middle of the 20th century the E.U. Dramatic Society was meeting weekly and holding classes in mime and movement, make-up and voice production, as well as lighting and production. It also presented three full length plays annually. Participation in clubs and societies has a very long history at Edinburgh University, stretching back into the eighteenth century. But the greatest expansion of such activity took place after the establishment of the Students’ Representative Council in 1884, and throughout the 20th century when vast numbers of organisations reflecting the great variety of interests of the student body were formed. This entry was posted in Uncategorized on 12/10/2010 by Archivists. The University Main Library is today in the middle of a major refurbishment, the first comprehensive work done to the building since it was built. Now an A-listed building, its origins were firmly rooted in the campus redevelopments of the late 1950s-1960s. This photograph shows a scene that is very much a turning point in the University’s history. Cowan House and Masson Hall, which were student residences located in George Square have been demolished to make way for the University’s new Library building, the foundations of which have been constructed. The building site for the Library and the adjacent Adam Ferguson Building are cordoned off, and various cranes and workmen can be seen progressing the construction work. A solitary vehicle on the south side of the square, the David Hume Tower and the tenement buildings on Buccleuch Place can also be seen. 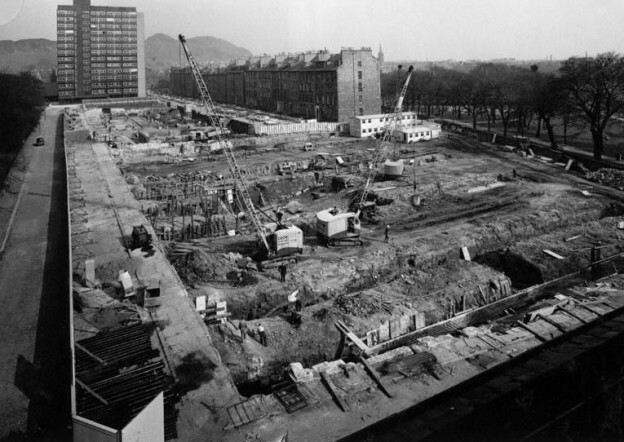 The redevelopment of George Square to house the expanding accommodation needs of the University was controversial and the original plan was never fully realised, explaining the present mix of Georgian terraced houses and 1960s buildings. This entry was posted in Uncategorized on 11/10/2010 by Archivists. This photograph shows the Faculty Council Members of the Polish School of Medicine. In 1941, as a result of World War II, many members of the Polish Army found their way to Britain. Amongst them were some medical specialists from Polish Medical Schools. On 24 February 1941, the President of the Polish Republic issued a decree officially instituting the Polish School of Medicine. On the same day, the University of Edinburgh signed an agreement with the Polish exiled government. Part of the Western General Hospital became the Polish or Paderewski Hospital. 120 beds were made available for soldiers and civilians, while clinical medicine was also taught. The School closed in 1949, having admitted a total of 337 students. This entry was posted in Uncategorized on 10/10/2010 by Archivists. Sports are still an important part of University life and we have a good photographic record of them from the later 19th century onwards. 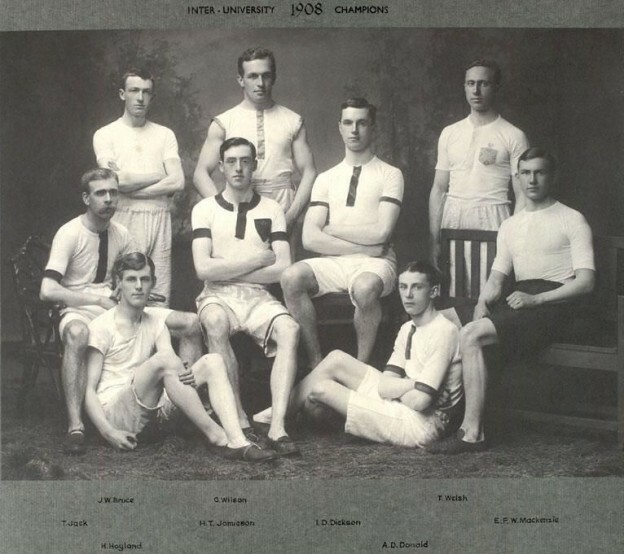 The photograph here shows the 1908 Athletics Team. The first athletic club annual sports were held in 1866, pre-dating the formation of the Scottish Amateur Athletic Association by 17 years. There were 16 events including a stilt race. Thousands of spectators were often present in the later 1860s and these early events later led to Inter-University championships. The team members are shown in a fairly close-up view, even allowing hairs on the athletes’ legs to be seen! Most of the nine strong team are seated on chairs and on grass but the studio ‘feel’ suggests the backdrop of trees is artificial. At this time Ian Dickson was one of the most prominent athletes winning many sprint races and finishing second in the Scottish Amateur Athletics Championships in the 440 yards to an athlete who was soon to become an Olympic medallist. This entry was posted in Uncategorized on 09/10/2010 by Archivists. This entry was posted in Uncategorized on 08/10/2010 by Archivists.